I no longer use Standard Theme. The developers have closed up shop and no longer support it. Regardless, I ended up developing my own theme. It’s called Get Noticed! 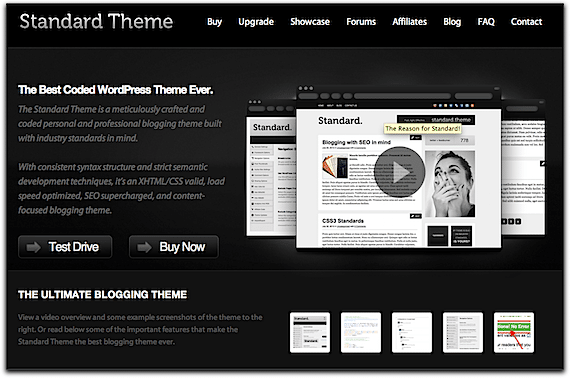 Theme for WordPress. If you’re in the market for a new theme—one designed specially for people who want to build a personal brand—check it out. One week ago today, I converted my blog to Standard Theme. You probably haven’t noticed much difference, because all the changes have been “under the hood.” I kept the design the same. When I had John Saddington redesign my blog last year, he started with the “Daily Edition” theme from WooThemes. It was a great theme and has served me well. But, frankly, the “backend” or administrative side had become a jumbled mess. (This wasn’t WooThemes fault or John’s; it was due to my own constant tweaking.) So I wanted to start fresh. My metrics have improved dramatically. According to my Google Analytics account, my visitors have increased by 38.4% and my page views by 43.8% in the week following the installation compared to the week before. I realize it’s only been a week; other variables may have contributed to this, including (perhaps) more popular blog posts. But I really think Standard Theme’s native search engine optimization (SEO) accounts for most of the uptick. My blog is easier to administer. The backend of the theme—the part where you manipulate how the blog is displayed to your readers—is really simple and easy to use. It is intuitive, allowing you to customize nearly every aspect of my readers’ experience. It took almost zero time for me to get up-to-speed. My blog is now using WordPress’s commenting system. Previously, I was using IntenseDebate, a third-party commenting system. It had a lot of great features, but, because it was hosted on a third-party system, it could be slow at times. Consequently, it slowed down my page load times. (And Google penalizes you for this in ranking your site.) In addition, the comments didn’t always sync up with WordPress, leaving my comment count off, which drove me crazy. My favorite plugins work flawlessly. First of all, with Standard Theme you won’t need as many plugins. They have built in some of the features that typically require plug-ins—things like social media sharing options, pagination, advertising, etc. But if you need additional plugins (and I still use too many), they work great, including ScribeSEO, which I cannot live without. If you are looking for a premium theme, I highly recommend Standard Theme. The guys at 8Bit are constantly improving it, and they have a great community of users for support and ideas. Question: What theme are you using? Have you ever considered Standard Theme?